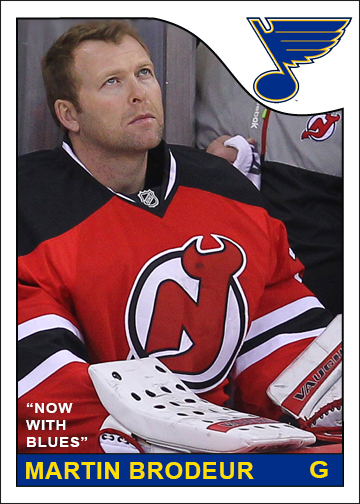 Martin Brodeur signed a contract with the St. Louis Blues yesterday. 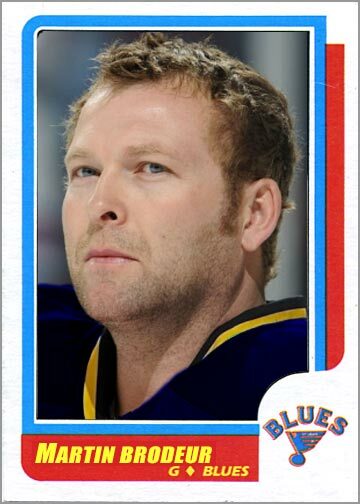 No doubt, cards of Brodeur as a Blues player will be included in upcoming sets like Upper Deck Series Two. But why wait for that? 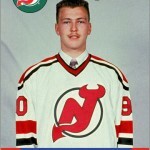 Why even wait for an official photo of Marty donning the Blue note? Thirty years ago, card companies didn’t wait; they took matters into their own hands — and so did I. 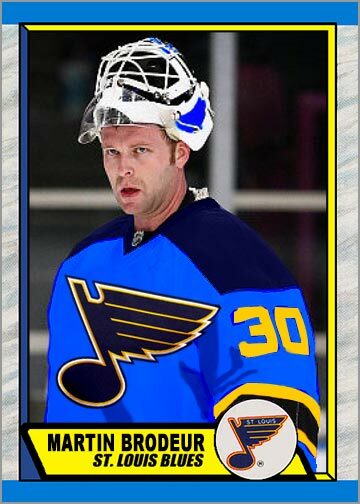 Want a card of Brodeur with the Blues? Well, I made four. 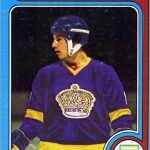 Back in the day, Topps and O-Pee-Chee went through drastic measures to “update” a photo when a player was traded. No waiting around for a new photograph, no sir. They made due with whatever photo they had, and their own ingenuity. Sometimes, the card companies would cleverly composite two photographs together, like a special effects artist, and we were none the wiser. 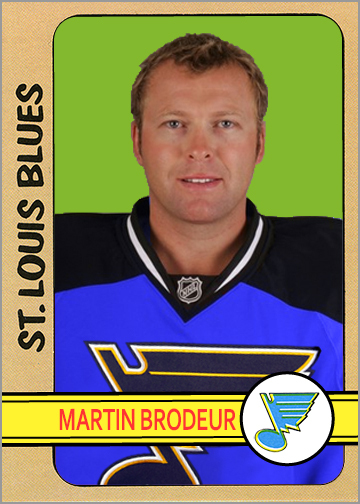 Now, I know what you’re thinking: Brodeur is NOT the team captain of the Blues. And to that I say, no he is not. Well…not yet (wink). Scissors and glue weren’t the only tricks of the trade back then. Sometimes, someone at Topps would channel their inner Renoir and bust out the paints, too. 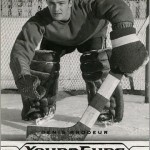 See, if you didn’t know better, you’d swear that Brodeur spent his whole career in St. Louis. 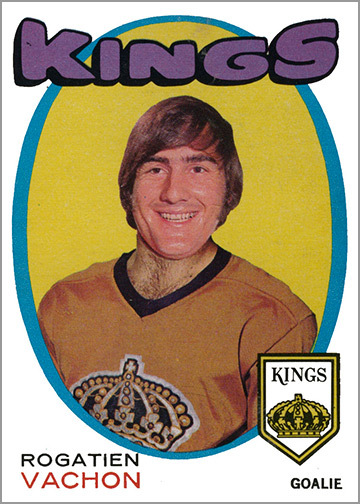 Just like I once swore that that Dale McCourt was with the L.A. Kings (and just like Dale McCourt once swore at the L.A. Kings). Other times, card companies “played it safe” and used the most close-up photo they could find. Because less jersey showing meant less paint used. Plus, kids hate action shots. Anyway, I’m sure Jacques Lemaire would be proud of this one. 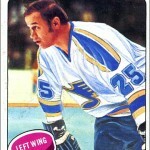 But if Topps had lots of time and art supplies, well then we would get a masterpiece of Clementian proportions — such as this game action photo of Marty with the Blues. 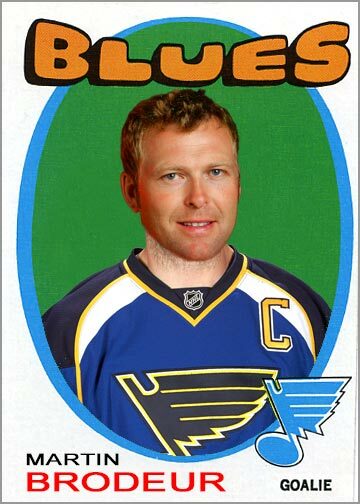 No, he hasn’t officially played a game for St. Louis as of yet, but when he does I’m sure it will look a lot like this. 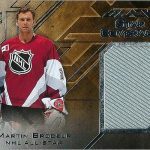 Great customs Sal, I love the nods to the painted cards of the past! You’re right. 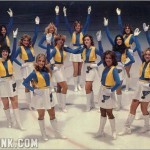 Maybe I should’ve left the Blues logo off the second one. Oh well. Perfect! Had to go back and look at some of my old gems in the collection. Always loved the few I have where the “artist” updated the player’s look to his new team. Thanks for the laugh. Thanks for reading…and the comment!